On Saturday 5 December 2009, just ahead of the crucial UN Climate Summit in Copenhagen, thousands of people from all walks of life will flood the streets of Dublin to demonstrate their support for a fair and safe climate future for all. 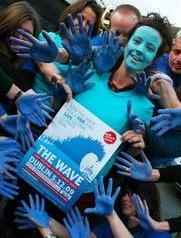 The Wave, organised by the Stop Climate Chaos Coalition, will show mass support for a better, low carbon future for Ireland and the world. It is a call to the Irish Government to show leadership at Copenhagen. We want them to PROTECT THE POOREST and ACT NOW to inspire the deal the world needs. The Wave is part of a global series of public actions calling on world leaders to support developing countries to cope with the impacts of climate change now and in the future. The Irish Wave will call on our government to take urgent action to secure a fair international deal to stop global warming exceeding the danger threshold of 2°C. Join The Wave! – The Ireland’s biggest ever demonstration in support of action on climate change.